Good sound and extraordinary durability at a budget price is the Sennheiser HD 202-II. Simple but well-built 'sealed-back' design is ideal for those needing affordable cans that will keep the ambient noise out while keeping all the music inside your head. Ideal for students, audio labs, voice monitoring, recording studios and those needing a tough general-purpose "beater" headphone, the HD 202-II is a wallet-friendly winner. The HD 202-II headphones from Sennheiser provide high-quality audio with exceptional bass response in a lightweight design, ideal for DJ applications and monitoring. The headphones have an extremely lightweight construction, and a closed-back design to help block out unwanted environmental noise. Turbine diaphragms provide a wide frequency response, while neodymium magnets and specially-designed damping material provide high sound levels and powerful bass. 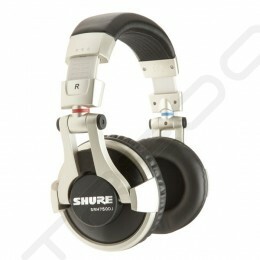 Each of the earcups can be removed from the headband, convenient for DJing and mixing. The leatherette ear cushions have a semi-circumaural design and are replaceable for convenience. An included belt clip allows you to adjust the length of the cable while on-the-go. The cable has a standard 3.5mm stereo mini plug and a 1/4" adapter for wide compatibility with consumer and professional audio devices.